The world is round, round like a green-gray melon. I believe this. I know this as fact. I know this deep within myself. I know this, not because I read it in a thick, dusty book or heard it whispered in my ear by a classmate. 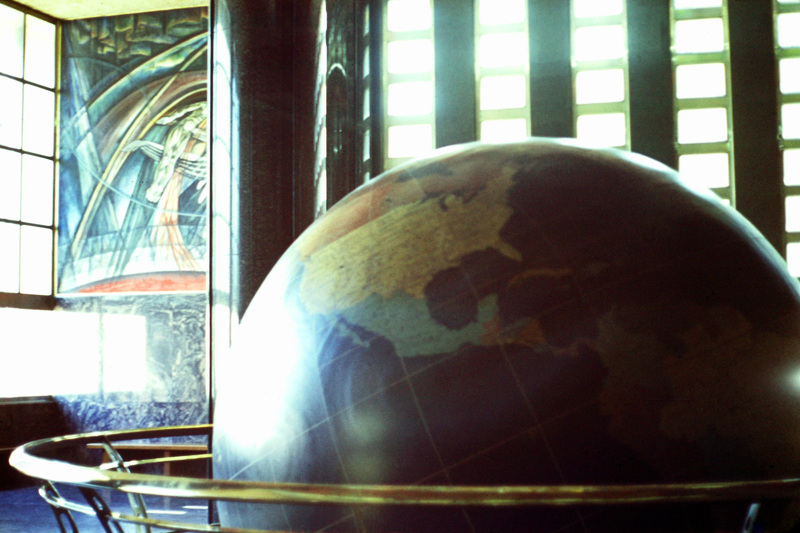 I know that the earth is round just like the globe I always stared at in the lobby of the building where the Waterman Steamship Line had its worldwide headquarters a few blocks from Bienville Square in Mobile. It was not because of Waterman’s globe that I know but because of her ships that I learned that the earth curves gently down before me as I look to the horizon. I know the earth is a ball because I have seen it for myself. I would wish for every human being the pleasure of seeing the Bay as I have seen it. I would wish for all the joy of seeming to do nothing, but of doing much just by sitting still on the rocks of the jetty that thrusts itself out into the water and by looking. I have watched freighters steam forty miles down the Bay, plowing the green water in a long foaming furrow-wake that flowed out unnoticed until it tangled with the bottom in the shallows and stood up to crash in a curling surf. I have watched the ships sail from the docks at the head of the Bay to the edge of the world underway to foreign ports with accented names. There, painted on the southern line drawn between sky and water, the ships—I have observed—slowly descended. First the hull sank low, then the superstructure, then the smoke stack, until, at last, only a plume of smoke trailed up like an arrow marking where she went over the edge. And watching that horizon intently I have seen smoke, just a wisp, pull up the barrels of chimneys from out the Gulf beyond Dauphin Island and Gulf Shores, chimneys I knew that were marked with a “W.” Then a hull would emerge with its red water line rising in turn from the Gulf. No dragons lay beyond the joint of the circle of green and the bowl of blue. Climbing a pine tree I could see a little farther over the curve of the earth and farther out to sea. I could see a little more than those who were content to stand on the ground. Joining them, I drew in the sand what my eye saw: a boy looking to the edge of sight, the corner of the sky. I imagined that the gulls could see a grander circle from their great heights than the small world of a fiddler crab on the beach. So on a calm day I plunged into the Bay’s quiet water sinking down until my eyes barely cleared the surface, a centimeter above the water line. There I saw it! The horizon zoomed in to only a thousand yards away. The beach across the Bay slipped out of view. Only the pine-covered tops of the bluffs of Fairhope peaked above the water. Mon Louis beyond Dog River sank and rose with me as I alternately sat or stood in the water. I saw the earth curving down before me obscuring what lay beyond my line of sight. A great exhilaration flowed over me like the water that dripped from my nose. I could see for myself the pregnant swell of the earth’s belly. I went again and again to the jetty. I always found it faithful. I studied hard at the school of seeing. One day I saw a long, low heap of water pile up. The quarter moon stood high in the pale blue sky, gray and ghostly. I saw the tide coming. I had seen the tidal flow before, swirling around the pilings at the mouth of Dog River. I had seen the boats float higher and higher on each swell. I had seen the tide stall the lazy flow of the river and send salt water upstream and into the creeks and sloughs and bogs, all the way up to the swamp puddle that lay behind my house. The combined pull of the moon and the sun reached across thousands of miles of emptiness to draw up the drops of water, at least a little. And the water’s surface tracked the sun and moon as the earth turned beneath them. Then I realized that the moon was pulling on me, too, lifting a fraction of my weight from me. Like invisible threads joining the dust of the moon and flaming gas of the sun to the cells of my body, gravity tugged and pulled at me. And I pulled back. The moon then adjusted its orbit infinitesimally because of my trek to the beach. I left the beach feeling the earth pull my bare feet to it in a weighty embrace. And my toes tugged back boyishly on the great green ball on which I walked and ran and sat, watching. And when the wizards of the flat earth tried to tangle my thoughts with purloined and perverted theories of light and gravity to stand arguments on their heads, I simply shook mine. The earth is round, I say, rounder than our imagination. This I know, for I have seen it. You have my word on it. But never mind . . . go see for yourself. Time for editing….Fairhope (If it is the city in Baldwin County) is one word. Enjoyed the piece.